The Chinese government is planning for up to 300 million people to move to cities in the next decade. This huge migration will place immense strain on infrastructure and housing, as well as on job creation. These people are moving for a better life, in hope of higher incomes and opportunity. The risk is social unrest if economic development fails to keep pace with expectations. The question is how long will it take for the urbanization process to be complete? Take Brazil, which has a population of 200 million, yet 85% already live in cities. We are no longer seeing a million new people a year drift into slum dwellings from rural areas. But China is different. It is interesting to compare China with the process of urbanization in America from 1840 to today. 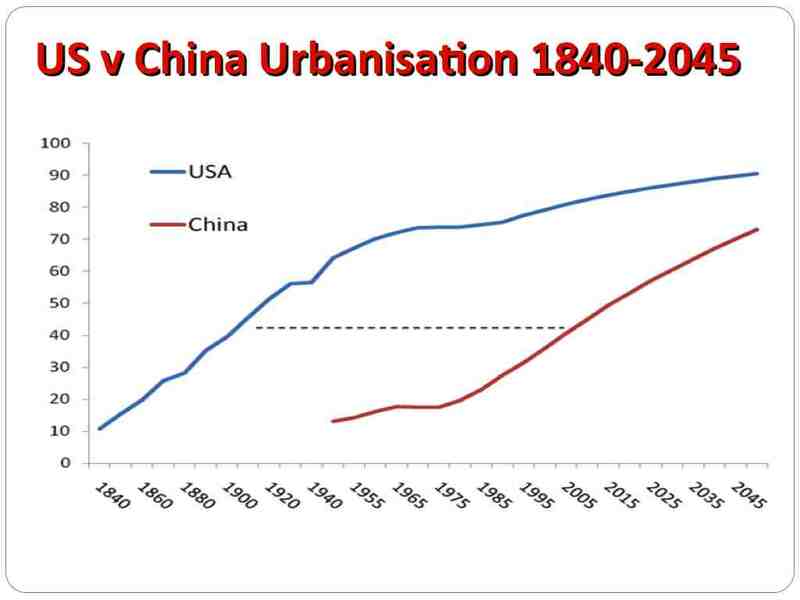 As we can see in the graph above, China clearly has a long way to go and on current trends will take until around 2040 to reach the same degree of city living as America had in 2010. While the process may be accelerated, it may not be in China’s interests to go much faster. There is a limit to the speed of safe development. As it is, by 2012, many skylines in China were marked by tall silent cranes, hanging over half-completed massive developments. Too many real estate investments, racing ahead of demand. Developers running out of cash, rural migrants failing to arrive, or to arrive with enough wealth to rent or buy what they were offered. Of course, this will be temporary: the relentless movement of people to cities, and creation of wealth, will catch up. China really does need urbanization because of the one-child policy (despite some relaxation) which means an acute shortage of young workers in industrialised cities. China’s economic growth depends on bringing wave after wave of new people into cities. 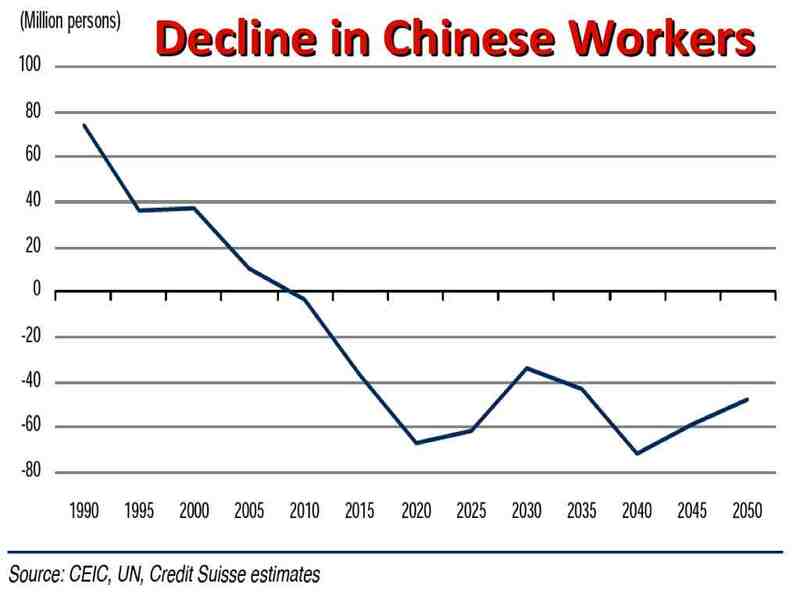 China has recently reached a critical point where young people entering the workforce no longer balances people retiring, so that the labour force is shrinking. The reality is more complex since the graph makes no allowance for the fact that people are living longer and may work for another 5-10 years compared to what they have done in the past, so it is hard to be sure what the actual net impact will be. * What do YOU think about the future of China? Do make comments below - I reply to each one.